Charles Kerwood was an American fighter pilot with the Lafayette Flying Corps during WWI (until he crashed), and later flew supplies and arms for the French Foreign Legion in Morocco (until he crashed). He’s also the inventor of a cocktail, the Burnt Fuselage. I first came across him and his Burnt Fuselage in Arthur Moss’s Cocktails Around Town , one of the appendices to Harry McElhone’s 1927 Barflies and Cocktails . Chuck Kerwood takes to the air so frequently that he likes a stiff steadier when he comes down to earth. The famous flying man calls his concoction the “Burnt Fuselage.” And believe me, ⅓ Grand Marnier, ⅓ Cognac, and ⅓ French vermouth, and your own fuselage will be warm, to say the least. The sweetness of that large proportion of Grand Marnier definitely takes the Burnt Fuselage out of the aperitif category, but the its sweet, brandy-driven fruitiness makes it a good choice for an after dinner cocktail. Stir all ingredients with ice until cold; strain into a chilled cocktail stem. Optionally, express and garnish with lemon twist. Cognac: It took some experimentation to find the combination of Cognac and vermouth that would blend properly with the Grand Marnier. In fact, I nearly gave up on this one. I had been using Rémy-Martin VSOP, which is my standard house brandy, but it just seemed to overrun the other flavors. The drink seemed disjointed, much less than the sum of its parts. Fortunately, I had an opportunity to make this drink with Ansac VSOP at a friend’s house, and suddenly the cocktail made sense. With the change in Cognac, the flavors combined much better. 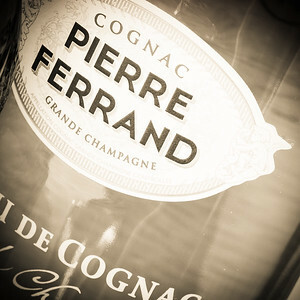 Later, I experimented with Pierre Ferrand’s 1840 Cognac, with good results. The only way I can explain the difference is that the Rémy has a bright sharpness, almost a spiciness, that makes it a bad fit with the other ingredients; the Ferrand, on the other hand, has a softer, oakier taste, with a little sweetness and caramel, and it seems to blend better with both the vermouth and the Grand Marnier. 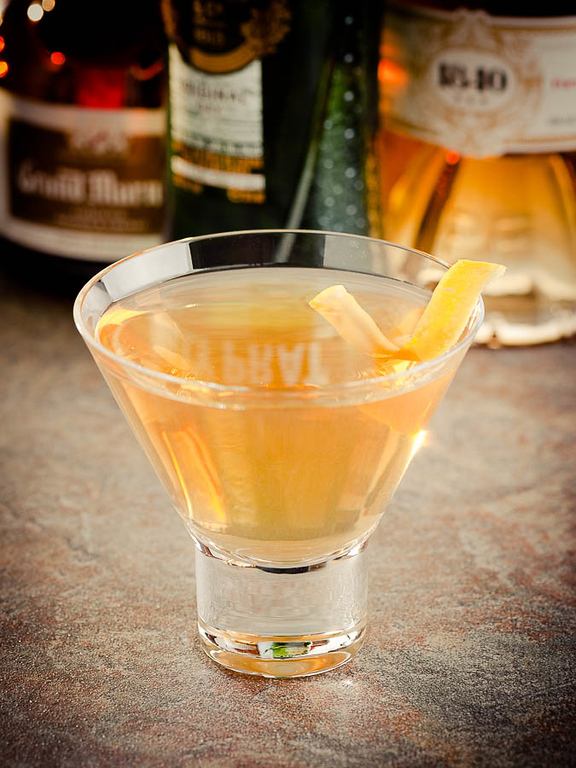 Vermouth: I was surprised to find that the vermouth seems to make a large contribution to blending the flavors. I experimented with a handful of dry vermouths, and expected the M&R to be too austere, but it seems to be what this combination needs. Grand Marnier: I tried cutting back the Grand Marnier as a way to reduce sweetness, but I do not recommend it. It seems the Burnt Fuselage is more delicately balanced than you’d think. Stick with the equal parts. Garnish: Moss’s original listing includes no garnish at all. Some subsequent listings include a lemon twist, or at least the lemon oils expressed over the drink. I think a touch of lemon oil makes a nice addition. I don’t know how many Burnt Fuselages Kerwood really drank, and I don’t know if he drank them before flying, after flying, or both. But I will say that he invented a very pleasant cocktail, and a very easy-drinking “stiff steadier.” I’m glad he made it back. “Stiff Steadier: the Burnt Fuselage Cocktail” at cold-glass.com : All text and photos © 2014 Douglas M. Ford. All rights reserved. It is awesome when we can figure a way out of a bad combination, just by swapping brands or changing proportions, also, nice to see Dry Vermouth being used as a showcasing ingredient. It’s always a jolt when I make a cocktail that’s supposed to be good, but ends up a sorry mess that just couldn’t have survived the decades. I had the same problem with El Presidente—that one nagged at me for months before I figured out how it earned its reputation. It just goes to show, there’s always something more to learn. Thanks for reading Cold Glass, and for taking time to comment! Yes, I had the same problem with the Sidecar. Good blog, keep up with the good work! In addition to the entertaining writing, I am continuously impressed by your photography – particularly the close-ups. Are you using a macro lens? Any special lighting? Thanks! Yes, I do use a macro lens for nearly all the photos. Some shots are natural window light, usually with reflectors; some are a mix of window light and strobe; most are made with diffused or gridded portable strobes and reflectors. One of these days I should do a little write-up about the photo side of Cold Glass; thanks for the reminder. And thank you for the inside scoop. I’m thinking about pulling the trigger on a Nikon 105mm f/2.8G IF-ED AF-S VR Micro Nikkor (whew, that’s a mouthful). I already have an SB-600 strobe that will do the trick with regards to light, although I should pick up something to diffuse/bounce. Looking forward to that article. The 105, that’s my guy! Do you happen to have further Cognac recommendations for this cocktail? I have the misfortune in this case to live in North Carolina, and the state-run liquor stores in my town don’t carry Ansac VSOP or Pierre Ferrand 1840. I usually use Remy Martin VSOP, but to be honest, I don’t have a lot of Cognac-drinking experience. Hi, Joseph, the Remy is one of my standard brandies, and it would work just fine. Thanks for asking, and I hope you enjoy that Burnt Fuselage. I’m sorry, but I thought you’d not had a good experience with the Rémy Martin VSOP here. I don’t have a problem getting, say, Courvoisier VSOP or Hennessy VSOP, or an XO. Yes, you are exactly right, and I shouldn’t have responded with the recommendation. I think the Burnt Fuselage slowed down my Remy consumption, and now it shares “house” brandy duty with Ferrand; I had forgotten this little contretemps I had with it making the Burnt Fuselage formula. My apologies for confusing the issue. So back to your original question: I’m really settling into the Ferrand line of brandies, so I don’t have a broad list for you to choose from, given that your supplier doesn’t carry that line. Your supplier may be able to advise you, based on what they have on the shelves. You may want to try it with the Remy anyway, since these things always end up being a matter of personal taste anyway. If it doesn’t seem right, your supplier may be able to guide you—my sense of it was that the Remy’s flavor was too aggressive, a bit spicy, and perhaps a bit too dry. It’s a very long time since I’ve had either the Courvoisier or the Hennessy, I wish I could guide you. Thanks for keeping me honest, and for helping me remember to focus up as I answer these comments. I think it must come down to that. It comes down to that in the end. I recently came up with a cocktail that was quite similar to this one, but with an Amaro in place of the Grand Marnier. My recipe called for 1.5 oz Armagnac (I used the Marie Duffau Napoleon, excellent for the price), 3/4 oz each of Noilly Prat Dry Vermouth and Amaro Meletti, and a couple of dashes of Angostura bitters. A very smooth drink.